There are nearly a thousand varieties of mint, but only six or so are worth cultivating. They are easy to grow in both shade and sun with an require very little maintenance needed. Their problem is that they grow too well! If left to their own devices, they will rapidly take over your garden. Mints were used by the Greeks and Romans both for flavouring food and as a medicine. Click folklore (right) for some of the myths surrounding mint. They can be harvested for at least six months of the year when grown outside, and are superb when used to flavour meats (lamb is best known), vegetables (especially new potatoes and peas), salads, tea and jellies. Mint is very tolerant of almost all conditions, but like all plants it will grow best in certain conditions. The soil should be well-dug, fertile and water-retentive, but not water-logged. 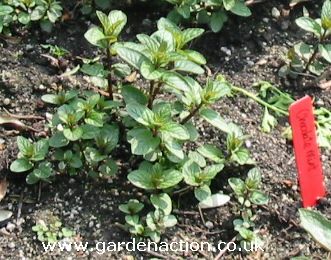 Mint is sold at most garden centres in small pots - as long as they are purchased after all danger of frost has passed, they can be planted straight outside. Mint has shallow, creeping roots which can be broken off and placed either directly in the ground or in pots containing potting compost. Because mint is such a strong-growing plant, it can easily kill nearby plants. The solution when planting outside is to sink a bottomless container, such as an old bucket, in the ground and plant the mint in this area. The roots might not be stopped 100%, but it will do the job. Another alternative is to dig a hole to a depth of 30cm (1ft) and line it with black plastic (pierced with small holes for drainage). The soil is then replaced in the black plastic and the mint planted in that area. 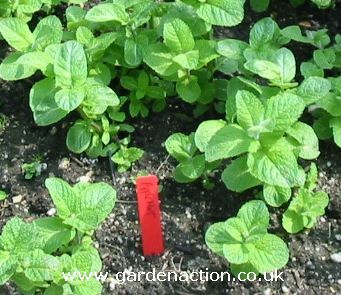 Mulching the soil will go a long way to keeping mint happy - it will achieve the all important job of keeping a moist root run which mint likes so much. A twice yearly feeding with bonemeal will keep it even happier. Remove the flowers by hand as soon as they appear because if left, they will reduce the amount of leaves. There is very little else to do except enjoy it. Mint suffers from only one disease and that is rust - allow it to get a hold and it will kill all your mint plants. There are chemical sprays for rust, but they can often be only a part solution. The best method is to examine each plant carefully for signs of rust (orange blobs generally on the underside of the leaves) and remove any leaves affected - spray as well with a chemical if you want. If this does not remove the infection chop the plant down to ground level and burn it all - drastic, but the only cure in the late stages of rust infection. Choosing a variety of mint is a matter of personal taste. However, for starters, shown below are a few tried and trusted varieties, all of which can be bought online by clicking ( ). Spearmint Mentha spicata - a traditional mint for mint sauces. A strong grower with attractive dark green leaves. Alpine Mint Bush Prostanthera cuneata - try something different, mint leaves with pure white flowers, a herb with true beauty. Chocolate Mint - really does taste a bit like mint chocolate!. A novelty worth a try? Message: why are some of the bigger leaves on my spearmint plant turning black in spots?? Message: True, plant them in a bottomless bucket or a stout wooden container, otherwise you will be inundated. Message: It's a shame you say there are only about a half dozen mints worth cultivating. You mentioned Chocolate Mint which does indeed taste like chocolate-mint, most definitely worth trying! There are so many varities that are worth trying too. Have you ever tasted the freshness of Orange Mint, Lemon Mint, or Lime Mint? The standard Spearmint and Peppermint are great but there's also Apple Mint and Grapefruit Mint which aren't so great raw but when used for culinary dishes really come into their own! And what about Pineapple Mint and Corsican Mint? Both very lovely! Not to mention Banana Mint, Moroccan Mint, Lavender Mint, Ginger Mint... many types also have a varigated variety as well! There is truely a mint for virtualy every taste! But the one thing they all do have in common is that shallow, invasive root system. Hi, I just invented a way of containing my mint and getting rid of pesky estate agents' signs [realters to the colonials] in one swell foop. Dig as thin a trench as you can and bury them in the shape of the containment area you want leaving 3" (7.5cm) above ground. Better still; get your offspring to do it. This might be too late, but it depends where you live really. If you live somewhere with a REAL winter, such as in the Midwest of America I'd say no. The frost, snow, lack of sunlight, and cold will pretty much do to mint what it does to every other plant in your garden. However, if you live somewhere like California (like me) then sure thing. As long as you can give them full sun and plenty of water they will be happy to grow and grow. Mint is easy to find at any garden store, such as Armstrong's or Home Depot. Actually, if you want to grow mint in pots (like myself) you can grow them year round indoors (such as in a conservatory or near a large window with light). Just know that even if you start off with a small mint plant, the roots will quickly overtake the pot, so you'll probably want to just start off with a large pot. If not, the mint will get all leggy and not stay full, bushy, and beautiful. Message: Hi My name is Vannie as u can tell! I want to know can it grow during the winter times? And also..where can I get them? Like where can I buy them? Thanks! Message: My 10 year old mint plants were demolished, leaves eaten, webs at the base. It looks like Gypsy moth infestation, but I am in California. The eaten leaves happened quickly, and now there are lots of little moths flying around. I live in a forest at 5,200 feet. Any ideas? Message: There are white stains under the leaves adn the mint is dying. �How can I avoid it? Message: How to cultivate mint for export sir ? so please help me sir . Message: I would like to grow plants for food because where I live wild mint grows and grows ... wild. Can you help advise me what plants would do great in that soil type and moisture condition. P.S. It's a natural spring where the mint grows, I am in southern california at 5,000 ft. Please help? Message: As a feild trip in highschool, we are creating a thrity foot in diameter, flower made entirrely out of flowers. I want to know How wide does mint get when grown?? Message: My mint is in full sunlight but watered and fed well. Recently, the stems have become dry and brittle and no new leaves are growing? Why do you think that is? Message: my mint plant getting black spot on their leaves, what should I do ?? ?